You Had Me At "Lets Go Get Food"
Food is life, am I right? This goes out to all of the people who love eating and consider food their butter half. If you think about what you're going to have for dinner while you're eating lunch, mainly only go to social events because there will be free food and never fail to crave Chick-fil-A on Sundays, this is for you. 1. Taco Tuesday is a lifestyle, not just a day. You don't discriminate, you will proudly eat tacos every day of the week whether it be Moes, Taco Bell, Chipotle or the real deal Mexican Restaurant. 2. The term "Hangry" is a real thing. According to Urban Dictionary, Hangry is "The state of being so hungry that it has become infuriating. A hybrid of hungry and angry. Craig: Dude, I'm so hungry, we ordered that Jimmy John's an hour and a half ago. Jansen: I'm gonna punch them in the face, I'm hangry." It's 1 am and you're randomly starving. Have no fear you know what is open, what is closed and what delivers. Shoutout to Waffle House for being 24 hours and shout out to Jimmy John's for delivering when I'm too lazy to drive. #Blessed to have a boyfriend that gets me. 5. 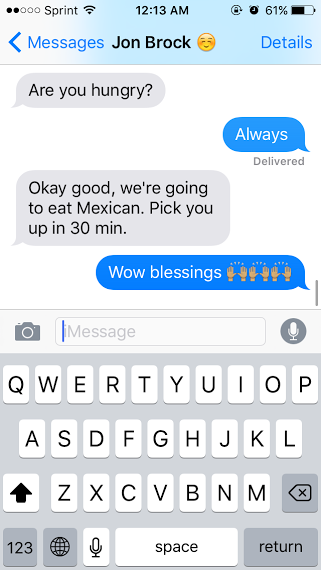 You have that one (or more if you're lucky) friend who will go with you no matter what time it is on a food run. Food runs are the best kind of runs because it doesn't actually involve running. I applaud these types of girls and honestly if a guy doesn't love you when you're eating a burger with fries and ranch and could honestly probably help him finish his too, then he's not the one. I'll be honest, on my first date with my boyfriend now of 3 years, we went to Longhorn and you bet I got the steak with mac n cheese and ate all of it, and salad (bathed in Ranch of course) and probably a whole loaf of bread. We've all been there. I've been eyeing the second half of your sandwich for 30 minutes. So... Are you gonna finish that? 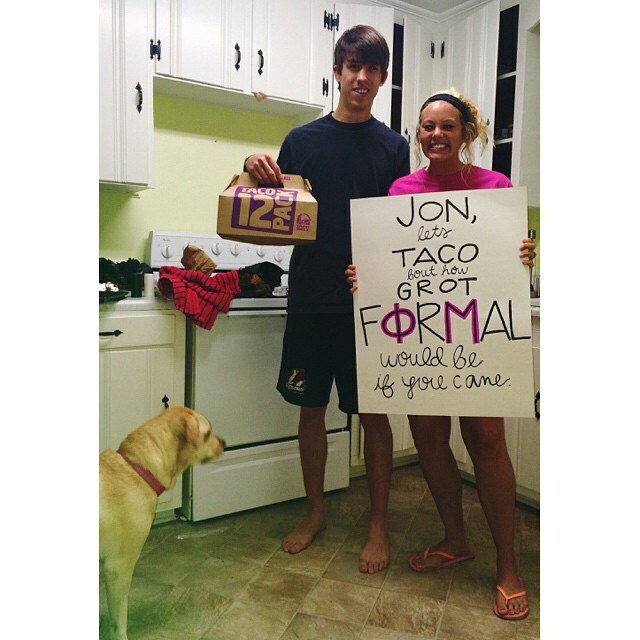 You love them so much you use it to ask your date to your sorority formal. "I enjoy long romantic walks to the fridge"
"I love you more than queso"
"True love is like that exciting feeling of when you see the waiter coming with your food"
No shame at all girlfriend, Becca and JoJo are right there with ya. "You earned it."